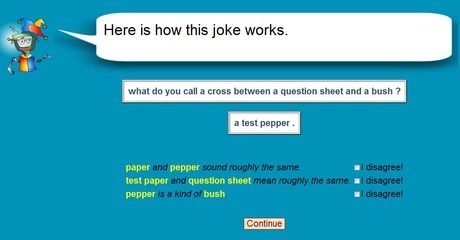 If you think the world is full of enough people making bad jokes, then you may not be delighted to hear that Scottish scientists have just invented a computer (and website) that makes bad jokes too. 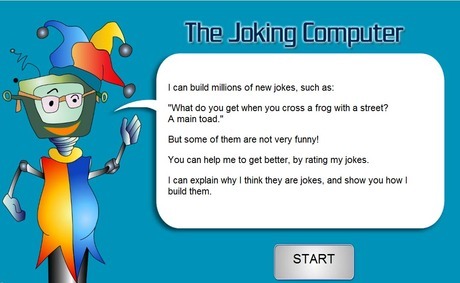 The Joking Computer software is programmed to make jokes and then it gradually learns to make better jokes using feedback from visitors. More than can be said for my dad anyway. 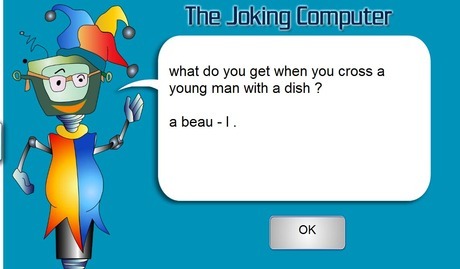 The Joking Computer was dreamed up to help kids with cereberal palsy improve their language skills. Q: why is a curious visual image different from a shining battle ? A: one is a funny sight , the other is a sunny fight . I’m laughing but not for the right reasons. After the joke you can rate it, and deconstruct where it all went wrong.. Anyway, it’s a good site to while away some time, potentially help children learn what good jokes are and who knows, find a gem that you can casually drop into your own conversation to make your friends rofl. NB, it won’t be the one below.